Can’t view 4K videos on Samsung 4K UHD TVs? You can easily fix the issue by converting 4K videos to a fully compatible format with your Samsung 4K UHD TV. Here is the simple how-to. So, how would you play other incompatible 4K files on your Samsung TV? Actually, it’s not hard work. You can play all those 4K video formats on Samsung UHD TV with the help of UFUSoft Video Converter. Overall, it is one of the best 4K video converter, player and editor out there. It is able to convert your 4K videos to the built-in presets for Samsung Smart TV regardless of the complicated parameter. Besides, this Ultra HD Video Converter is available to transcode 4K videos to any format MP4, MOV, WMV, FLV, MPG, AVI, MKV… as you want to meet your different needs. Thanks to the built-in video editor, it can also help you trim, crop and retouch your 4K videos in clicks. If you are running on Mac OS X, UFUSoft Video Converter for Mac is the alternative choice, which allows you to batch convert 4K clips to Samsung TV friendly format on Mac(macOS High Sierra, macOS Sierra, El Capitan included) at high speed. Now download the right program and refer to the guide below for more conversion instructions. How to convert 4K videos for viewing on your Samsung UHD TV? 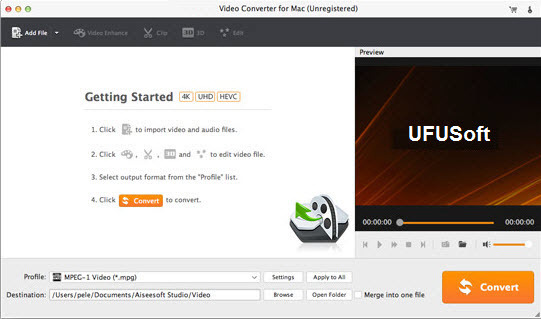 Launch the 4K video converter; click “Add Video” and load your 4K UHD files. This program supports batch conversion, so you can add multiple files into it at a time. Click the “Format” button to select the best format for Samsung Smart TV “Samsung TV(*.MP4)” from “TVs” Category. Of course, you can select a proper format like H.264 MP4 from Common Video profile, which can be viewed on Samsung TV perfectly. 4. Lossless conversion – no output quality loss. | Comments Off on How to Open and Play 4K Videos on Samsung UHD TV?